50 People? Read and act! Pretty please? Ok, I get it. We don’t like to talk about dying. We really don’t want to think about it enough to consider what will happen to our organs and tissue. It’s a bit creepy and unnerving, But, what if your daughter needed a kidney? What if your grandson needed a skin transplant? I bet you’d get on the list and I bet you would urge everyone you know to get on the organ donor list as well. Organ donors save lives. Tackle these myths, carry an organ donor card, and let your loved ones know that it is very important to you that they allow your organs to be used in the event of your death. Fact: When you go to the hospital for treatment, doctors focus on saving your life — not somebody else’s. You’ll be seen by a doctor whose specialty most closely matches your particular emergency. The doctor in charge of your care has nothing to do with transplantation. Fact: Organ donation is consistent with the beliefs of most religions. This includes Catholicism, Protestantism, Islam and most branches of Judaism. If you’re unsure of or uncomfortable with your faith’s position on donation, ask a member of your clergy. Another option is to check the federal Web site OrganDonor.gov, which provides religious views on organ donation and transplantation by denomination. Fact: That’s true, in a legal sense. But your parents can authorize this decision. You can express to your parents your wish to donate, and your parents can give their consent knowing that it’s what you wanted. Children, too, are in need of organ transplants, and they usually need organs smaller than those an adult can provide. Fact: Organ and tissue donation doesn’t interfere with having an open-casket funeral. The donor’s body is clothed for burial, so there are no visible signs of organ or tissue donation. For bone donation, a rod is inserted where bone is removed. With skin donation, a very thin layer of skin similar to a sunburn peel is taken from the donor’s back. Because the donor is clothed and lying on his or her back in the casket, no one can see any difference. Fact: There’s no defined cutoff age for donating organs. Organs have been successfully transplanted from donors in their 70s and 80s. The decision to use your organs is based on strict medical criteria, not age. Don’t disqualify yourself prematurely. Let the doctors decide at your time of death whether your organs and tissues are suitable for transplantation. Fact: Very few medical conditions automatically disqualify you from donating organs. The decision to use an organ is based on strict medical criteria. It may turn out that certain organs are not suitable for transplantation, but other organs and tissues may be fine. Don’t disqualify yourself prematurely. Only medical professionals at the time of your death can determine whether your organs are suitable for transplantation. 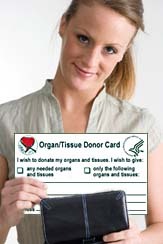 Fact: The organ donor’s family is never charged for donating. The family is charged for the cost of all final efforts to save your life, and those costs are sometimes misinterpreted as costs related to organ donation. Costs for organ removal go to the transplant recipient. A few things you can do right now … will you please do them for me? 1) Register for the donor bank RIGHT NOW online at http://www.organdonor.gov/how.asp and discover a number of ways to help. This site has a link to every state’s registry. 2) Please, so many people are depending on you, please print out this donor card form and mail it in today. 3) If you are on Facebook, please join our transplant awareness efforts at http://www.Facebook.com/liver4scott by choosing LIKE at the top of the page. 2 Responses to 50 People? Read and act! Pretty please? Thank you, Scott, for the reminder. I have been on the organ donor list for many years now….. I wonder if my organs are now too old??? I guess wrinkly skin is welcome when you need it! thank you for posting this. This is the way your Aunt Mary feels about it.